Ever since Chester Moore Hall conjured up the ingenious two piece optic to reduce chromatic aberrations in the telescope in 1733, optical designers have ceaselessly created recipes of design and differing glass types to try to prevent nature from dividing white light into its constituent coloured components in optical systems. For a long period in the early years of microscope and telescope history, chromatic and other aberrations had been part and parcel of all the images seen in both instruments. Using single lenses with the resulting dispersion of white light along the optical axis, was the only means of observation, yet much was discovered by these relatively crude devices. Techniques to reduce this imaging plague, such as using pinhole apertures for the microscope, and very long focal lengths for the telescope, to a reasonable level, only served to reduce the effectiveness of both instruments. The resolving power of the microscope with pinhole apertures was handicapped, and these long telescopes became unwieldly to handle. So when the achromatic solution came along, so did the realisation of more faithful images. There are two basic problems concerning the reduction of image degrading aberrations, and though the design of the optical combination is to reduce both, it is a fact that they are inextricably linked, and so a compromise has to be allowed for. 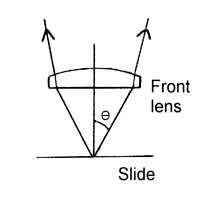 The first is chromatic aberration, which is the way glass lenses split up white light into its constituent colours along the optical axis, and the second is spherical aberration, which is the inability of easily fashioned optical curves to bring all the light to a designed point along the axis. By combining lenses of different optical properties and focal lengths the problem of colour dispersion and spherical aberration can be minimised, and this achromatic combination is without doubt the most common optical image maker in all sorts of instruments to date. The colours which have been given most attention by the designer of the achromat are those that the eye is most sensitive to ie yellow-green. The spherical aberration correction is in this region too. For about 100 years or more the achromatic combination continued to be refined, and in 1882 a more complex combination of optics was designed to reduce chromatic aberrations even more successfully, which was called an apochromatic combination, and enabled the focussing of 3 colours, 2 of them being being spherically corrected as well. About 1886 Carl Zeiss started to produce apochromatic objectives, using a naturally occurring mineral called fluorspar, which having very low dispersive powers was used in combination with other types of glass. Modern optics make use of synthetic glasses having optical properties similar to the natural fluorspars, having more consistent properties as well as being easier to work. There have also appeared a series of optics known originally as semi-apochromats, which also utilised fluorite and possessed some of the superior properties of apochromats, are generally called 'fluorites', and are sold under a number of trade names such as Neofluars, Fluars, Fluotars etc..
Interestingly, a yellow-green photographic filter can improve the achromats performance in black and white photography simply because it removes the red-blue secondary fringes from the image, and can provide imagery which is superior to that seen by eye. It must be emphasised that these three types of optic are not entirely different, but share some commonly based principles of image making, and that they also vary somewhat in their design and construction, according to various makers. Nevertheless there are three basic types. The achromat is the 'simplest' of these and usually uses a minimum number of elements to achieve its purpose. The examples a,b,c,and d above show achromatic combinations of x 2.5, x10, x40 and x100 objectives respectively. At e is shown an example of an apochromat x 100, where it can be seen to be exceedingly complex in structure, with a total of 10 elements, a proportion of which will be fluorite. The difficulty in working this mineral together with the work and expertise required to fashion and accurately align 20 optical surfaces of glass of very small size accounts for the intrinsically high cost of this type, which can exceed $ 3-4000. The eyepieces used with apochromats are the compensating types, and there purpose is to apply equal and opposite corrections to the differential amplifications of the objective to different colours, and whilst these differences increase toward the edge of the field of view, the eyepiece compensates in an equal yet opposite manner. Thus the image produced is a designed interaction between the objective and eyepiece, and it is interesting to note that compensating eyepieces, though inappropriate for lower power achromats, do work quite well with achromats having single front elements like the x 40. If in doubt about an eyepiece, the appearance of a red fringe around the edge of the field indicates it is of the compensating type. Eyepieces for achromats tend to have faint bluish fringes around the field's edge. The fluorites also require compensating eyepieces, and like the apochromats do not function correctly with eyepieces for achromatic optics. In Victorian times high na was the fashion simply because the microscope was beginning to yield remarkable details especially in diatoms, and by increasing this angle of illuminated cone, more detail was rendered visible. This trend had its problems, such as limited depth of field, and more exacting optical design and construction. More recently manufacturers produce objectives of lower numerical aperture and a typical example of an achromat of x40 would be 0.65 na., with correspondingly larger depth of field, less sensitivity to cover slip variations, and lower cost. Plan or flat field objectives are used with relatively restricted na to cater for wide field scanning of tissue cultures and cell counts and also photomicrography of specimens. Since the apochromat can yield more faithful imagery, it is usually designed and constructed to resolve as much detail as possible, and hence possesses very high na. So a range of apochromats would normally be made with the following apertures : x10 0.5 na, x20 0.75 na, x40 0.95na, and x100 1.3-4 na. Comparing 4 different objectives may seem a bit pointless, as we could argue that to make a significant appraisal of performance, objectives of essentially similar design need to be assessed. But the reality is that objectives of one power made by different manufacturers vary in design and purpose anyway, and to expect to make true comparisons here can lead to erroneous conclusions. I have therefore simplified the issue, and I think made a more interesting comparison of objectives, by simply selecting one of each type, which are readily available to the amateur. The 4 objectives were placed in the turret of a Wild M20 stand using a Watson Achromatic Universal 1.0 na condenser and x10 compensating and achromatic oculars. A-B-C-D testing was carried out with a slide of diatoms in brightfield, partially oblique, and darkground illumination. This was perhaps the most revealing of all the tests, but other specimens were used such as butterfly scales and tissue preparations, as resolution was not the only factor being considered. I was aware of the fact that comparing these 4 different optics with differing na and optical construction can lead to contentious issues, but nevertheless it was an interesting and somewhat revealing excercise. I have tried to be unbiased ( very hard ! ) and put marks for performance out of a total of 10 as seen below. Adjustments to my subjective appraisal were frequently made as the number of observations increased intermittantly over a period of about a week. It surprised me that the assessments took longer than expected simply because I thought that each objective deserved 'personal' treatment of the substage settings to bring out its best performance, and also because I wanted to be sure that my conclusions would be fair. The marks were essentially awarded for resolution and contrast, but I have also made relevant remarks below which would have been impossible to tabulate above. It must be emphasised that the following comments concern only the 4mm dry objectives tested here, and any remarks which I have made about these do not necessarily indicate any similar properties to other powers of comparable types. There were few surprises, in that the apochromat was clearly the superior image maker, but the differences were not as obvious as I had previously imagined. In fairness to the other three objts. the apo had superior na to start with and so its ability to render fine diatomic detail was therefore expected, but the fluorite wasn't far behind. Indeed the difference between the two resolution wise, varied from very slight to slightly more obvious, and much depended on the correction collar of the apo to bring out its best. More noticeable was the slightly inferior colour corrections of the fluorite's image, but again this was not so obvious. The Wild achromat yielded very commendable images, with slighty more colour fringing, but the old no name achromat produced a typical image of its vintage, and though fair resolution was noticed by comparison to the others in the test, lacking modern anti-reflection coatings seriously prejudiced any chance of scoring higher marks. A factor which may have hindered the fluorite's capability was varying coverglass thicknesses, and since this optic has no correction collar, it may have been working at a disadvantage on some slides, which might account for the variation I noticed between the performances of the fluorite and apochromat ? The differences between all four objectives became less obvious when examining thicker tissue specimens, and when used for general work. The apochromat could not be focussed on some slides because of its tiny working distance, a very important issue nonetheless for anyone expecting an all resolving all embracing easily handled objective........... ? Using a pair of Wild x 10 compensating eyepieces, field flatness and quality of image at the field's edge were noted, and here the humble achromat scored highly, having relatively good resolution at the edges and centre and a fairly flattish field. The apochromat's imagery at the field edges was reasonable, but this is not a problem in viewing practice as most specimens will be centred where its superior resolution was most acute. However, the fluorite wins in this department having a reasonably flattish field, and very good resolution right across it. Finally, as the depth of field of an apochromatic optic utilising its full 0.95 na aperture is truely miniscule, the stand supporting it needed to be rigid and possess a very smooth and dead pan fine focus. Indeed the smallest movement of the fine focus on the M20 stand could not go unnoticed with the apochromat. I think the one enduring revelation out of all this testing, is that it is the quality of design and construction of the objective that really matters, and not whether it is an apo, achromat etc.. I emphasise that during general observations of specimens not possessing very fine detail, the differences between the quality achro, fluorite and apochromat were small to almost indistinquishable. The bottom line is if you expect miracles from an apo, think again. The differences between a quality achromat and apochromat are fairly subtle, and even less so between the fluorite and apo. However the cost differentials are startlingly obvious, and unless you can acquire an older example of an apochromat in good condition at reasonable cost, without interior defects, which the old lenses made from the early glasses at the Schott works in Jena tended to suffer from, then the considerable outlay for one, let alone a flatfield plan apo, might disappoint in the long term ? If I had to conclude on one aspect of this apochromat, it was the 'colour fidelity' of the image which endured, aside its resolving ability, which in this example just pipped the fluorite. If the specimen examined did not contain very fine detail, then the apochromat and fluorite appeared neck and neck, though the colour purity or fidelity of the apo's image was always slightly superior. The observation of very fine detail is not an easy task, and requires much concentration, as well as time for the eyes and mind to adjust. Unless your interests are seriously into diatoms and their understandably detailed beauty, or other work requiring faithful colour rendering, as in critical photomicroscopic work, then I humbly advise anyone to stick with or aquire top quality achromats, or the fluorites, if finances permit, as being the winners when all aspects of finances, practicalities, ease of use, working distance, coverslip sensitivities, and diversity are taken into account. The much revered high aperture x 40 apochromat, like a F1 racing car, requires the utmost control in suitable conditions if it is to perform to its very best, and with the help of x15-20 compensating eyepieces to enable the maximum of detail to be seen comfortably. And those who may be intrigued by their reputation should think very carefully about the pro's and con's before parting with serious money. The oil immersion achromat of 1.25 na. will reveal more detail at a lower cost of course, with some added inconvenience, and might be a better choice if only occasional observations of finely detailed specimens are made ? Overall the fluorite gets top prize, followed closely by the achromat for value for money. The apochromat however, despite its inherently colour faithful and superior detailed images, is a pernickety performer whose arena of true excellence is limited and comes at maximum cost. Finally, I often wonder whether observers like myself who appreciate using quality optics, find themselves occasionally looking at the image rather than the subject ...................if you follow my drift? I guess the real truth is that, when we are peeping at something of real interest, we tend to forget the apo's, achro's or fluor's and let our minds concentrate and enhance the images, which they have been perfecting throughout evolution ? All comments welcome to Comments to the author sent via our contacts page quoting page url plus : ('pjames','')">Paul James. Published in the December 2000 edition of Micscape Magazine.